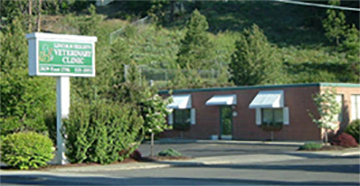 Lincoln Heights Veterinary Clinic was established in 1970 by Dr. Michael Perry. Dr. Perry is a Michigan native who relocated to Spokane in the late 1960's. Dr. Perry took a special interest in birds. He was one of the first veterinarians to see birds in Spokane. Lincoln Heights Veterinary Clinic started as a one veterinarian practice with one employee. In the 1980's Dr. Perry hired a second veterinarian and a couple more employees. In 2011, our clinic has evolved into a four Veterinarian practice with three Registered Technicians, five Veterinary Assistants, and three Receptionists. Dr. Michael Perry's daughter Christine graduated veterinary school at WSU in 1998 and came to work with her Dad that fall. They worked together for the next four years until Dr. Michael Perry retired. Lincoln Heights Veterinary Clinic takes great pride in the fact that we still have clients coming to our clinic that started with us in the 1970's. It is these clients and all the new clients that have chosen us to care for their pets that have made it possible for us to care for pets for over 40 years. Lincoln Heights Veterinary Clinic, P.S.